Careful Planning + Useful Advice = Effective Marketing But don't forget to throw in a good mix of experience and creativity with a dash of reliable management. Andy and Sue combine their creative skills and marketing experience to provide you with a personalised solution to suit the growth of your business, product or event. 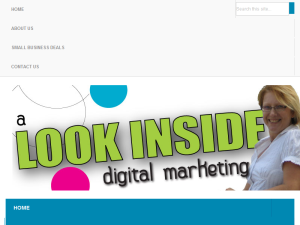 This what your Look Inside Digital Marketing Blog Ad will look like to visitors! Of course you will want to use keywords and ad targeting to get the most out of your ad campaign! So purchase an ad space today before there all gone! If you are the owner of Look Inside Digital Marketing, or someone who enjoys this blog why not upgrade it to a Featured Listing or Permanent Listing?